I finally finished the series!!! Woo hoo! It was my summer goal to finish the series. This is the last book in the series. It follows Percy as he finds out if the prophecy refers to him. I won’t give it away, but this book has the most action of the entire series. The entire book is one giant climax. We learn secrets, meet tons of new monsters and gods/goddesses, and we find out how the Rachel-Percy-Annabeth love triangle ends up. This final installment will keep you going, and you won’t want to put it down until you just finish it already! At least that’s how I felt. What I liked about this book series is that I learned so much more about Greek mythology than I would have learned from just studying the family tree. I like Greek mythology, but I could never keep all of them straight. Titans, Olympians, minor gods, monsters, heroes, etc. Now, I could explain how at least 20 of them are related without even looking. I found myself google imaging them, as well as looking up the pronunciation of characters I’d never heard of. It was exciting for me as a learner, and I remember being schooled by my sixth graders at the beginning of last year when we started to learn more about Greek mythology. The Percy Jackson fans basically told me how to draw the family tree. So if you want to be smarter than your sixth graders, read this series before teaching your Greek mythology unit. 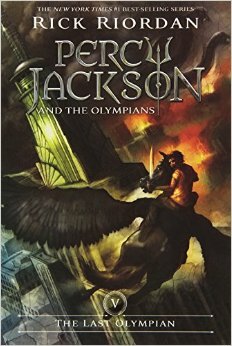 What I didn’t like about this series is that I sometimes didn’t know what was Greek mythology and what was Rick Riordan. He gave some of these people such distinct personalities. Was Aphrodite really that vain? Did Ares really go around picking fights? Did Poseidon really wear Hawaiian shirts? I’d say the line between fact and fiction (fiction and fiction?) was hard for me, but on the other hand, VERY appealing to sixth graders. If you’re looking for some light reading that will keep you engaged and teach you a thing or 20 about Greek mythology, or if you’re a boy who hates to read, this is your series. I was very pessimistic and didn’t think I’d enjoy anything about it, and I was hooked. 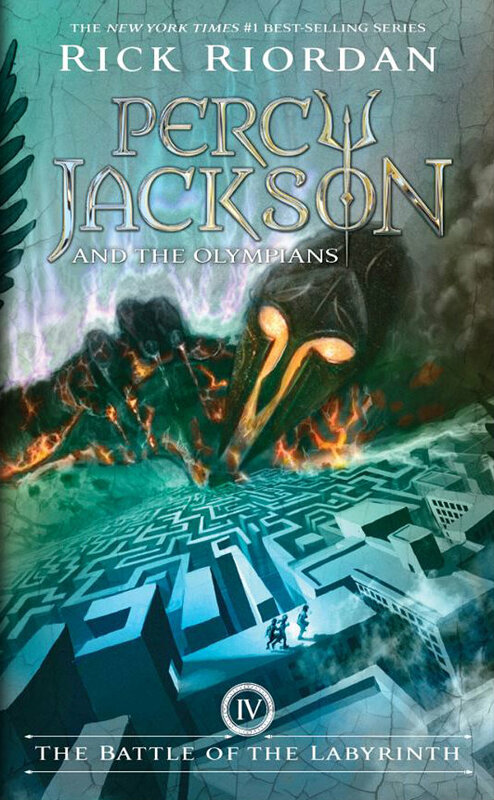 This is book 4 of the Percy Jackson series. Like in every book of the series so far, Percy faces a monster at the beginning and flees in a traumatic and urgent fashion. The difference is (and we will get to this again later), he was going to a school orientation set up by Paul Blofis and then meeting Annabeth for a pseudo-date. So he is confronted by an empouri masquerading as a cheerleader, then heads out in a hurry, with the assistance of Rachel Elizabeth Dare, a mortal he met in book 3. The story follows their continued battle against the rise of Kronos and his “helpers” (monsters, mortals, half-bloods, etc.). Annabeth leads the quest through Daedalus’s labyrinth to find Daedalus and stop Luke from leading Kronos’s army to destroy the camp. We find out what happens to Nico and Bianca, we meet Pan and Grover’s his girlfriend, and my favorite part… Percy Jackson proves himself to be a normal teenage boy with typical feelings for the ladies. Calm down, it was totally rated PG… 13 (brief kissing involved). 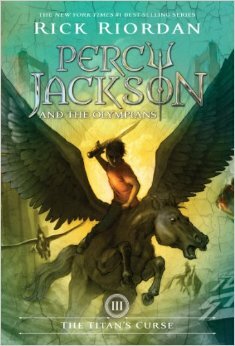 What I liked about this book was, of course, how Percy’s relationship with Annabeth heated up a bit. Throw in a mildly attractive Rachel Elizabeth Dare and Calypso and you’ve got yourself some really tough situations for an awkward young man. What got me really excited, though, was Poseidon showing up to Percy’s birthday party. Totally unexpected. There are a lot of predictable aspects to this story, but that threw me, and I actually really appreciated more facetime with the gods, especially Percy’s dad. What I didn’t like about this book… there isn’t a whole lot to say that I haven’t already mentioned in my other posts. It isn’t a challenging novel. It doesn’t get me as emotional as Harry Potter did. However, I can see how it would attract students, especially non-readers (or readers who hate reading). It isn’t my favorite series, but I am looking forward to the last installment. Rick Riordan is an entertaining writer who knows how to write for kids. No AR Level – Teacher Professional Development! I know a lot of my friends think I’m nuts, but I’ve been going through a “thing” where I want to set goals for myself as a professional. I don’t have any plans to leave the classroom, because I really, really like having a class of students for a year. I love challenging myself and learning new things and refining my craft, though. Helping others teachers is fun and challenging, but I don’t see a future in administration or adult education. I would like to someday work towards National Board Certification, and I have Apple Distinguished Educator stuck in my head, but for right now, I just want to be a better teacher to my incoming sixth graders. This is one of the few teacher professional development books I have read voluntarily. I bought it, because I was really looking for $7 to spend to get 24 hour shipping on my Math Workshop book, and since I always have those students who I can’t get to pick up a book and stick with it, I figured it would give me some ideas. Some ideas! I now want to revise the way I do reading! I will no longer have AR time, but a time to get in the zone- the reading zone (not auto zone… hee hee, bad teacher joke). Nancie Atwell is an experienced teacher of seventh and eighth graders in a non-profit school with a diverse population in Maine. She has been teaching for 20+ years and has done her research on the best methods and strategies for teaching reading and getting non-readers (or kids non interested in reading) to read. 1. We want our students to be come smarter, happier, more just, and more compassionate people, and they can achieve that through frequent, voluminous reading. They get to experience others’ lives and worlds through the books they read, which will influence them as people. Isn’t this every teacher’s goal? It justifies silent reading and home reading. 2. Free choice of books should be a young reader’s right, not a privilege granted by a kind teacher. She advocates spending funding on our classroom libraries, not class sets or packaged curriculum. Every student has the right to learn, and good literature is necessary to create readers. 3. Requiring students to do work with their reading has the opposite effect. We want our students to like reading, but if we make them stop to take notes, fill in reading lots, answer questions, take quizzes, etc., it is like watching a movie and making them stop every 20 minutes to discuss or write about it. I wouldn’t want to do that! This idea is painful for me, though, and I probably won’t be able to do this completely. I will do lit circles and book studies in addition to their independent reading, but I won’t do reading logs or summaries. 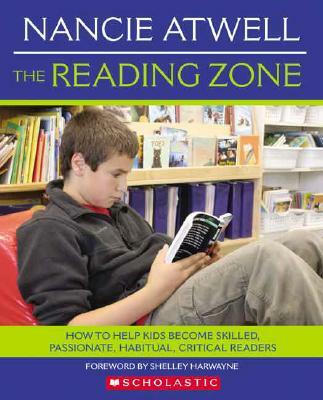 I will do my best to involve parents here to ensure students are reading in the ZONE at home. 4. Booktalks introduce students to good literature. These can be done by students after finishing a book, or the teacher can give a booktalk. This can be done in several ways, including talking up books by an author, books in a certain genre, books in a series, oldies by goodies (pre-1995), quick reads, etc. It doesn’t require media presentations, but I might have students do booktalks using technology and post them somewhere so other students can go back and use them to find a good book. She also has her students keep a list of “someday books” so that when they finish, they have a list of books to get started on. 5. One-to-one letters help the students to think critically and at length about one book. She has her students write a letter every 3 weeks after finishing a book. If they finished multiple books in that 3 week period, they only choose one that they most want to talk about. There are no summaries involved, because it is assumed they understood the book. Instead, she has them follow a list of items to talk about, stems, etc. to get them started, and they must quote a part of the book and explain why that quote is significant. I started book letters, but couldn’t find a way to read all 35 per week. This strategy has them write a letter every 3 weeks, and they write to friends and her, so she’s only reading about 12 letters per year. That’s completely doable. There are so many more “ahas” from this book, but I don’t want to make you think you’re getting it all in this blog. It is a book that all teachers should read if they want their students to become well-read and read for pleasure. 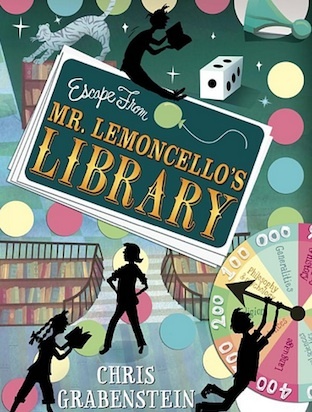 Escape from Mr. Lemoncello’s Library is about a boy named Kyle who isn’t a fan of reading. He loves games, however, especially games by Mr. Lemoncello. He is the youngest of three boys, and he doesn’t have a “thing” like his brothers. One is a great athlete and one is a great student. Kyle is chosen to participate in a competition in a high-tech library funded by Mr. Luigi Lemoncello, and he soon finds he should’ve been a better reader. The 11 other students in the competition either become allies or enemies of Kyle. They work together to solve puzzles and riddles, and use their knowledge of books to get themselves out of the library before noon on Sunday. What I liked about this book is that it promotes team work and kindness, literacy, and responsibility. There are certain prizes and rewards afforded those who work together and demonstrate generosity or teamwork, and that might not be obvious to the kids. It is not written at a challenging AR level, but it does get the students to think about the book and puzzles. I think it would be over the heads of many of my students, only because most don’t have the experience with most of the titles and authors, or even rebus puzzles. I enjoyed testing my knowledge of books, though! Kyle is an avid gamer, and this book would attract other students who game. What I didn’t like about this book was that it wasn’t very challenging. I still felt like some of the puzzles weren’t answered, or maybe they were, but it skipped over those parts. It felt like some parts of the book were really slow, while others were really fast. Also, the characters weren’t well-developed. The author gave just enough information for us to follow along and understand the book, but it left me wanting more of something. I just can’t put my finger on it. There were lots of opportunities for the author to create more, but I think he gave us what we needed to know. It was an okay book. Not a 10, but I had no problem seeing it through, mainly because I wanted to see how they got out.